Hone your shooting skills on dummy targets, then move up to fighting it out with thugs, and if you can survive that long, you'll finally face off with super-boss ED! Behold! Physics, gravity, booty! Customize your pirate cruiser and sail the stupid sea's, battling other pirates for untold wealth, treasure and fun times. Watch out for the abstract missiles! The Strangers is a unique first person assassination shooter game. Follow the directions carefully, take a deep breath and squeeze the trigger. Move around and shoot everything that moves. Dont forget to reload. Destroy everything on your way. Retro shooter that starts slowly but quickly ramps up the pace. Try to complete all missions and defend the boss, or survive as long as you can. Take up arms with one of the 20 possible weapons and fight back against an army of relentless attackers! How long will you last? 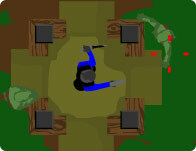 Build defensive structures to protect the base from enemy army. This is only the beginning. Sink your teeth into but a hint of a multi player shoot em up stick adventure. Defend your Nuclear Missile Base from a army of U.S. AirForce jets as you try to launch all your nukes.